The survey delves into the current state of new kitchen projects: the reasons, the money, and dare we say it, the ingredients. It provides real insight into the world of the new kitchen. The data is obviously very useful to professionals in the kitchen industry: the designers, manufacturers and retailers. But, it’s also a great resource for anyone who is planning a new kitchen in the near future. How much are people spending? Why are they updating? What styles, colours and materials are people choosing? Here are a few details gleaned from the study that we think are either surprising or of greatest interest to you if you are planning a new kitchen. This is the big one: how much do people spend on their new kitchen? Various factors affect this: rising costs, rising property values, ease of borrowing, abundance of architectural and design TV programming. None of us like to waste money on a poor investment, so it is reassuring that the quality of the kitchen is a hugely important factor in home valuations and the ease of selling a house; it is becoming an increasingly important living area of the home. The most common cost range is between £10,000 and £25,000, with nearly a third of respondents spending within this bracket. A further 38% spent over £25,000 and the remaining 30% spending up to £10,000. Despite the rather uncertain economic predictions and the extraordinary political news of 2016, nearly 10% spent over £75,000 on their new kitchen. On what did these people spend their hard-earned money? More than half chose a contemporary kitchen (56%), with a surprisingly small amount opting for traditional or country styles (10% & 7% respectively). The once standard kitchen wall finish: ceramic tiling has dropped quite markedly in popularity over the years, accounting for just 22%, whereas painted walls is now the preference for 84%. The most popular layout style is the U-shape (32%), closely followed by the L-shape (28%). This is probably indicative of the move towards larger kitchens, opening out into other living areas of the house in 59% of new kitchen projects. Another indication of the growing size of our kitchens is that nearly half (42%) feature an island. That once trendy, must-have peninsular is now only found in 12% of new kitchens. One stand-out appliance addition, usually considered very much a luxury option: the boiling water tap, is now installed into very nearly a quarter of new kitchens (24%). White remains the popular (and safe) choice, with grey now coming a close second, and beige a surprising third. Gone are the days of the large numbers of coloured kitchens being installed (who didn’t have a red kitchen in the 80s?). Appliance colour choice is firmly rooted in stainless steel (nearly half), with a significant quarter opting for black. Worktops are quartz (24%) and white (27%) most usually, other popular choices are granite (20%), grey (17%) and black (15%). A new kitchen is not just about impressing friends or keeping up with the Jones, although more than half of respondents say they now host more dinner parties and entertain more often since the kitchen refit — if you’ve got it, flaunt it! A whopping 69% say that since their new kitchen became reality they spend more family time in the kitchen and 35% of respondents say they now lead a more healthy lifestyle. Of course, it is unclear if this more healthy lifestyle is a cause or effect of updating the kitchen; more clues to this below. Not surprisingly, the most common motivation for spending money on a new kitchen is moving house; we like to personalise our homes and this reason accounts for nearly half of the new kitchens in those surveyed, 26% cited a deteriorated or worn out kitchen, and 14% gave their reason as a change in lifestyle. Somewhat surprisingly there was no significant figure investment. We probably all know that DIY is now a declining skill and trend. This is echoed by the figure of 93% who hired a professional during their kitchen project. Very nearly half employed a kitchen designer and a third used the services of an architect. This is hardly surprising given the large amounts of money people are now spending on their kitchens. 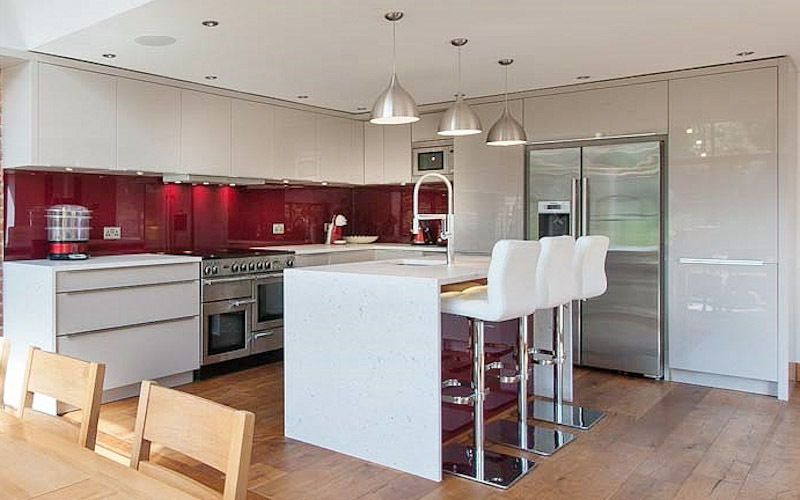 To get further insight and expert advice on your new kitchen, call Black Rok now on 01825 766976. More details to be found in the published report on kitchen trends. See Black Rok on the Houzz website.